And for this year, this will be the final Irish barn. Not the final barn, just the final Irish barn. 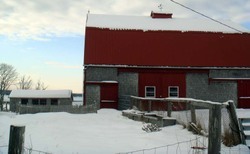 In 2009, I plan to add more Irish barn photos! 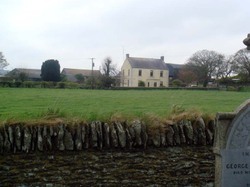 Behind and to either side of the farmhouse in this photo, one can see barns. These seem to have the straight rooflines, rather than the domed or curved metal roofs. The walls are like the farmhouse - concrete blocks with a plaster coating outside. Hedgerows appear to be defining the barnyard, and in the foreground is a lovely rock wall. Some of the rock walls were entirely laid vertically, others like this one, had a decorative vertical top border, and still others were totally laid horizontally. These rock walls define some amazing pastures and fields with even more amazing stories of how the Irish made useable land from what appears to natively be simply rock. These farmers' ancestors had fortitude! Sorry for more through-the-coach-window photos of barns, but it was that or nothing! The places we stopped were not farms, so there weren't any to shoot when we were stopped, and as I wasn't driving, and a 24 passenger coach can't exactly just stop anywhere without blocking traffic, I took what photos I could when I could. This is another of the curved roof barns. This, like last week's barn, is a two story affair, and again, it appears to not have many windows - just the door for loading the second story. The hedgerow fences did not have fencing wire or materials in them or next to them - the hedges themselves are sufficiently thick to keep livestock in the pasture. The countryside was lush green despite just coming out of winter, and still having their winter temps at hand. This one appears to have the more modern, semi-circular metal roof on it, as opposed to the traditional roofline of the one last week. One can see in both of these barns that there are few windows in the structures - I am not certain if that has to do with the weather, cost to build a window, or the climate inside the structure itself. That is a hedgerow fence in the foreground there. Our coach driver, Frank Fitzpatrick, indicated these hedgerows just keep growing and the farmers simply trim them to the depth they desire. I had to seek out barns while in Ireland! And seeking them out was somewhat fraught with issues, given that we were on a coach, I wasn't driving, and I wasn't making out the agenda for the day. We'd come around a corner, and there would be a barn, but by the time the camera turned on, we'd be past it. 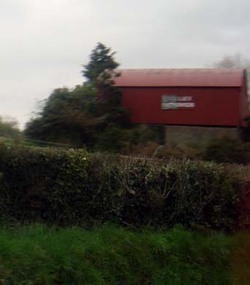 So, I have very few photos of the Irish barns. I am intrigued by the differences in barns there vs. here. Now I wish I'd paid more attention to the barns in Scotland last year! 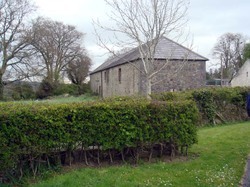 The Irish barns seemed to be of two distinct architectural styles. The first is probably the traditional and older form, was of concrete block construction with thatched or slate roofing materials. These generally had plaster coating on the outside of the walls and very few windows. The second style, which is probably more modern, was one with a semicircular metal roof instead of the thatched or slate roofing. The sides of these were varied - some the concrete block/plaster variety and some metal. There were very very few wood buildings in Ireland that we saw (if any). I suspect that the building material choices are dictated by what materials are available for the right price. Stone seems to be abundant in Ireland and Scotland, whereas wood is not. The use of the building would also dictate its architecture, but I need to do some reading about that. The more I look at barns, the more interested I am in them and their regional differences! Barns here in New England have a different flavor than barns out west, or in Pennsylvania, or down south. I suspect it reflects the climate, the purpose of the land, and the ancestry of the land owners and how they were taught to build barns, as well as the local materials available, and terrain. 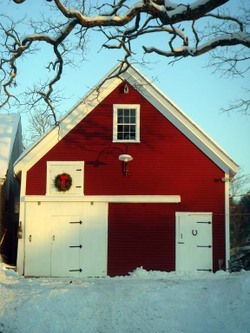 Here in New England, it seems like most barns are the "L" configuration where they are attached to the farmhouse through a series of progressively smaller structures. 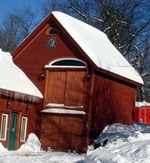 Because the barn is thus attached to the house, a farmer could go tend the animals without having to brave the snow, or shoveling to get there. 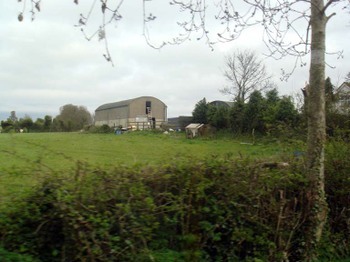 This barn, while not attached to the house, does have its own series of annexes, which I thought were interesting. One can see on the white addition that the original sliding door has been replaced with a person hinged door and adjacent window as the use of the structure changed. We've now had a week of temps approaching 50 and we still have several feet of snowbanks next to buildings... it was a very good snow year, and we broke a number of snowfall records. I've had a barn hiatus here since Hero's surgery and such. Just before leaving for Ireland, my spinning buddy and I did some barn photography on our way to spinning with the ladies. Maine is the only state I've lived in (now eight total) which seems to name towns after other countries and foreign cities. There is a China, South China, Norway, Lisbon, Denmark, Dresden, Frankfurt, Lebanon, Mexico, Moscow, New Sweden, Naples, Peru, Poland, Paris, Rome, Stockholm, Sweden, Vienna, Wales, etc. Today's barn comes from the area near Athens, Maine. I actually don't know that I could find it for you again, but here it is. This one is a detached barn, with nice color contrast seen from the road. 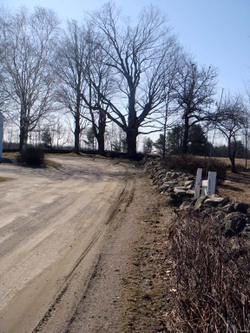 The pasture in front butts up to a state highway, but the side and back road is a country lane, lined with fruit trees and rock walls. The snow is melting now finally, but the trees have yet to bud and the grass is slowing turning green. 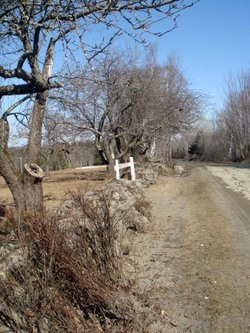 These rock walls line the country lane behind and beside the barn above, bordering an orchard, and a pasture to the side. In many areas here in New England, one can find remnants of old rock walls from settlement days. I even have a partial one in the back of my property - the so called "keeper" fences or walls, as they kept neighbors friendly by delineating property lines. Very few are in the wonderful condition of these walls. 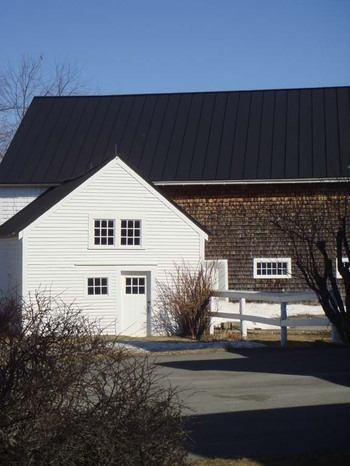 The lean-to type addition to the right of the barn above is what is locally called a "baker's addition." I'll have to do some more digging to find out the history of that name for such an addition to the barn. Another barn. I am hoping soon to be able to get inside barns owned by people I know or who know people I know. I'd like to get some texture/character pictures from inside to go along with the outer character we can see from the road. This particular barn had a great picket fence in front and on the left, and behind it, one can see the water from the bay. It had a cupula similar to one of my earlier barns, and on the left hand end of the barn, there was a lightening rod as well. I attempted to get a close up, but it didn't show very well. You can click on the photo for bigger. The December mid-afternoon sun - the northern climate really shows this time of year! This barn was cool from the back side. It has nicely weathered cedar shakes, and interesting windows. It dwarfs the owners house, and has a little addition building there at the back corner, Gambrel style roof, picturesque brush in the foreground. 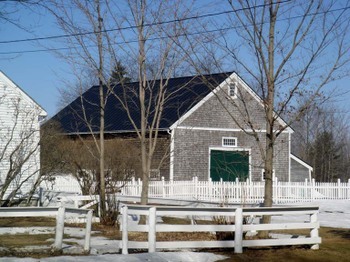 This barn is another from the drive over to Castine. I like this one for several details - it has an old fashioned ironwork fixture for the spotlight (one can see its shadow to the left of the spotlight), a door-within-a-door on the front, and beside the sliding barn door, there is an old fashioned lantern hanging from a peg. The accompanying house was the reverse coloration - white with a red door. The front door on the house had a twin wreath hanging, as well. This is an example of the several red barns that caught our eyes on this barn seeking road trip! I love the gnarly tree branches in the upper portion of the picture.